Emergency roof repair in Sandy Springs is no laughing matter. It’s a serious home repair that needs attention right away to protect the integrity of the home. Ignoring roof damage won’t make the problem go away. It only makes it costlier to fix and opens up your home to a host of water damage issues. If you need roof repair in Sandy Springs, here are some things you need to know. Some people believe that emergency repairs only apply to big gaping holes in the roof caused by weather damage, tree damage, or some other unexpected, sudden event. However, many emergency repair jobs are smaller in nature, but pack a huge punch. For example, don’t wait days or weeks after you notice water stains on your ceiling. While missing flashing or small problems may be the root cause of the problem, the longer you wait to call for repairs, the more water damage ensues. If a tree falls on your home or high winds peel back sections of your roof, there’s no time to waste. You need immediate emergency repairs before permanent repairs get done. Once the situation is safe, cover the roof with large, blue tarps found at home improvement stores. 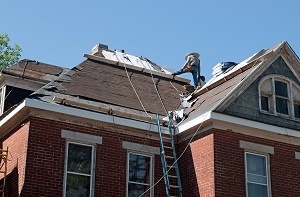 In situations where a weather event affects a large number of homes, it takes time for roofers to get to you. Covering the damaging helps prevent additional water damage. Does Homeowner’s Insurance Cover Roof Damage? Homeowners needs to read over their policies to know what they are and aren’t responsible for in the event that you need roof repair. Roof cost in Sandy Springs isn’t cheap, especially on homes with high peaks and intricate elevations. So, it makes sense that homeowners want to utilize their insurance. In the event of weather damage, most homeowner’s policies cover the cost of repair and roof replacement, minus the policy holder’s deductible. If the roof is damaged due to age or normal wear and tear, the out-of-pocket costs may fall squarely on the homeowner’s shoulders. If your insurance does cover the roof repair or replacement costs, ask your insurance company how to find a roofer. Some insurance companies allow homeowners to choose their own company and the insurance company pays the invoices. 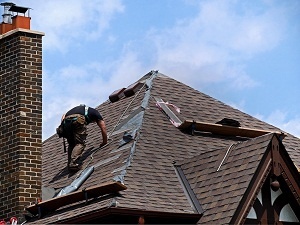 Other insurance companies work with specific roofing companies in the area. Make certain you know your insurance company’s restrictions and policies to make sure you don’t end up owing more out of pocket that required. While some instances can’t be avoided, ways exist to protect your roof from unexpected damage. For example, if your yard has dead trees or large trees with dead branches, have these removed. Regularly have your roof inspected for small signs of damage and fix these problems before they become widespread and catastrophic, financially and structurally. These tips keep emergency roofers away and more money in your bank account.